Lakeside Country Cottages & Boat Slip Rentals at Lake Wallenpaupack. Lakeside Country Cottages are located in a private wooded area situated in a quiet cove on Lake Wallenpaupack. Fully equipped cabins ready for your enjoyment, please bring your own linens. Boat slips available- located in a quiet and protected cove. The cottage has two bedrooms, a loft, fully equipped kitchen & outside fire rings. The property has excellent lake view, 1200 feet of lake frontage with boat slips available. Boat and Jet-ski rentals on premises for an additional fee. Conveniently located near the new Mount Airy Casino. See a list of our local attractions on our website for more ways to enjoy your stay with us. Come enjoy the beauty of Lake Wallenpaupack and the Poconos in our quiet and secluded community. There are many activities to enjoy during your stay, such as, swimming, boating, camping, hiking, BBQ, and more! Lake Wallenpaupack: Lakeside Country Cottages are located on Lake Wallenpaupack. This large lake covers 5,700 acres and is 13 ½ miles long. There are 52 miles of shoreline for exploring, and six recreational areas which feature picnic areas, walking trails, boat slips, and hundreds of acres of forest lands. Lake Wallenpaupack has since become a major recreational and tourism area in the Poconos. There are several marinas nearby to Pocono Home Rentals that offer our guests boat launch areas, Jet ski and power boat rentals on premises. . There are also a variety of parks perfect for swimming, fishing, picnics, and just relaxing. The size of the lake makes it perfect for boating, jet skiing, water skiing, and water tubing. Guests of Lakeside country Cottages can also enjoy the many antique shops around the lake. There are several golf courses, horseback riding stables, paintball, a spa, and much more for you to enjoy. Pocono Fishing: Guests of Lakeside country Cottages may enjoy the great fishing at well stocked Lake Wallenpaupack. Lake fish include large mouth bass, small mouth bass, rock bass, walleye, and pickerel. There are also rainbow trout, brown trout, catfish, yellow perch, striped bass, hybrid striped bass, and muskellunge (muskie), a relatively rare freshwater fish. Fishing in the Pocono Mountains is a year round activity, with a variety of species and traditional fishing, fly fishing, and ice fishing. There are thousands of miles of public streams, rivers, lakes, and shorelines to fish in the Poconos.Fishing licenses are required for fishing in the Pocono Mountains for residents and out of state visitors over 16. Poconos Hunting: Poconos hunting offers a wealth of opportunity for hunters. There are an estimated 40 deer per square mile in the Poconos. Pennsylvania is second in the nation for the number of deer caught each year. There are 1.2 million acres of state land in Pennsylvania, much of it right nearby for great Poconos hunting. Poconos hunting options include black bear, fox, coyote, raccoon, wild turkey, pheasants, ruffed grouse, rabbits, groundhogs, mallards, Canadian geese, pintails, and squirrels. Promised Land State Park and Rickett’s Glen State Park both offer excellent Poconos hunting of small game. Stayed in Cottage #3. This appeared to be one of the nicer cottages on the property. It was clean and comfortable. We are the type of people that were constantly on the go, so we didn't really spend a great deal of time at the cottage itself. Had a fire every night at our own private fire pit. There was a grill for cooking out but we didn't use it. 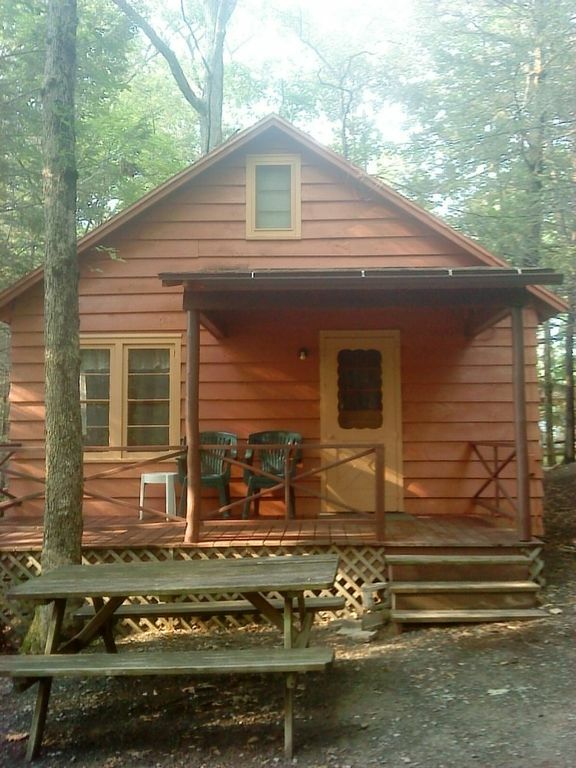 The cottage was a short walk to the lake and a close drive to restaurants, attractions, convenience stores and hiking. Place was pet friendly, which was a plus. Overall for the price it was very nice. Thank you for your review Tom! We're glad you had a great time during your stay. We really hope you can visit us in the future again! Lots for road noise. Worst mattresses ever, but pretty view. Dear Margaret, it makes us happy to know you liked the place. We're sorry about the inconvenience you experienced with the road noise. Really hope it didn't hinder you from having fun during your stay! More like rode site... not a lake site! Prepare for Aunts, Mices, Rats... etc! Good location, clean and friendly service. Great location, store short walk away and everything else a short drive away. Clean, cozy cottages, nice quick getaway couple of hours from NYC. Wonderful outdoor area. Close to the lake. Easy to get to. Close to the lake. Out side area was very nice. Inside was good also. Hot water and kitchen good also. The loft area if you have 6 people hard to get up to with that ladder.